I read this article and found it very interesting, thought it might be something for you. The article is called Needed: More Women To Fight Indian Elections and is located at https://archive.indiaspend.com/investigations/needed-more-women-to-fight-indian-elections-71184. 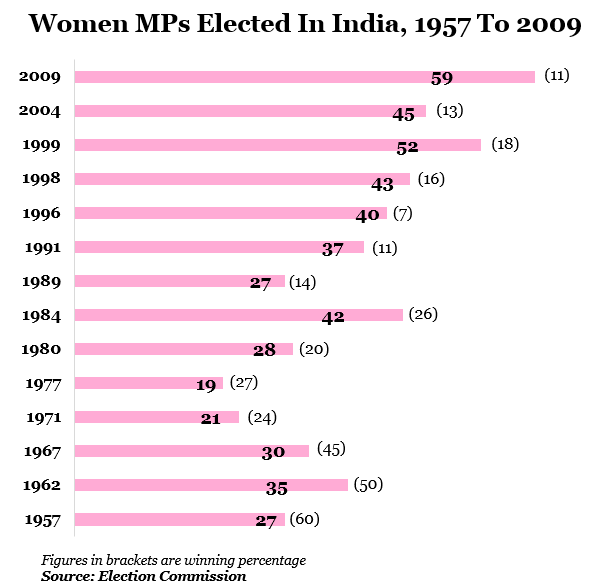 The good news first: the number of women in India’s Parliament has slowly increased over the years. But in contrast, the percentage of women winning if compared to the number standing for elections is actually dropping. Put another way, more women are contesting the elections than ever before but failing to get elected. This is a cause for concern in some ways. There might be good reasons (which we are not getting into here) why proportionately less women are winning elections. But if there are a high number of independent women candidates who contest and don’t win, then being independent and a woman clearly seems to work against you. Starting 1957, an average of 232 women candidates has fought elections for every Lok Sabha. Of this, 36 win, a winning percentage of 24% but a mere 7% representation in a house of 543 elected members. Almost 5,018 male candidates fight the elections, on an average, of which 494 win, a winning percentage of 10%. Incidentally, women candidates are doing better than male candidates – the winning percentage of women is more than double of men. Interestingly, the United States has 17% women representation while UK and China have 23% representation, respectively. African countries like Rwanda and Andorra have the highest women representation of 56% and 50%, respectively, followed closely by Cuba with 49% representation. 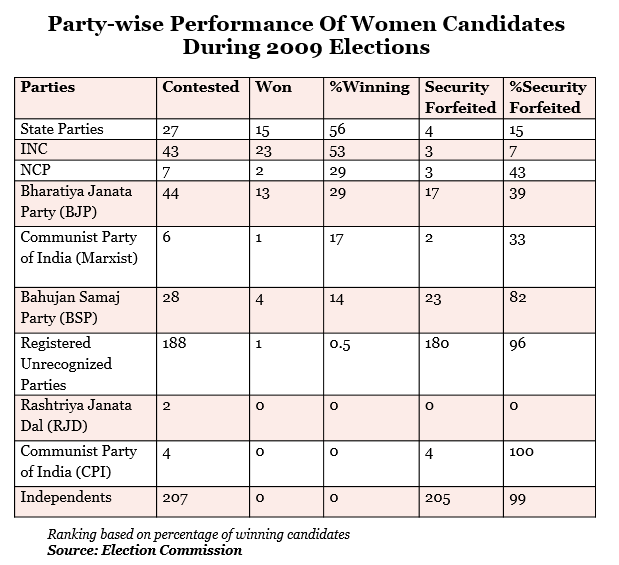 The party-wise performance of women candidates in General Elections 2009 shows that Indian National Congress (INC) and Nationalist Congress Party (NCP) had the highest percent of women candidates winning while Bahujan Samaj Party (BSP) had the highest percent of women candidates whose security deposit was forfeited. The following graph gives an idea of the women candidates contesting, getting elected and the winning percentage from 1957 till 2009. From 1977 to 1996, the number of women contestants increased but there was a sharp 46% drop in 1998. Incidentally, the period 1996-99 saw three general elections, one in 1996, then in 1998 and in 1999 and a turbulent political phase with caretaker Governments. Another major jump is noticed in 2009 by almost 36%. However, the winning percentage looks dismal. After 1967, the winning percentage has reduced drastically by 46%, and since then has seen a decreasing trend. 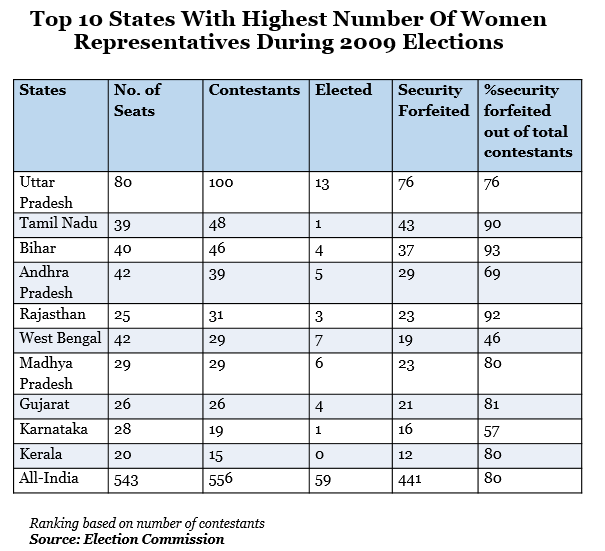 Uttar Pradesh had the highest number of female contestants (100) partly because of it has the largest population and the highest number of seats followed by Tamil Nadu (48) and Bihar (46). Out of the big states (considered for these analysis) Kerala (15) and Karnataka (19) has the lowest number of women contestants, followed by Gujarat. A large number of women candidates have seen their security deposit of Rs 25,000 get forfeited in 2009 elections. The all-India average is 80% and the highest proportion of candidates forfeiting their deposits are from Bihar (93%) followed by Rajasthan (92%) and Tamil Nadu (90%). The lowest is from West Bengal (46%).Understandably, the party or the ticket has a role to play in the success or otherwise. How does an independent woman candidate view all of this? We asked banker-turned-aspiring politician Meera Sanyal, an independent candidate who contested the 2009 Lok Sabha polls from the South Mumbai constituency. “Quite frankly, I think we need more independent thought in our country! While there are honest and sincere people in all the major political parties, their voice seems to go unheard. And thanks to the Anti-defection Bill, every MP has to vote as per the party whip. It is only independents who can vote fearlessly as per their conscience and in the interests of the nation,” says Sanyal. Sanyal also feels that politics in India is still a relatively closed club and voices like hers are essential to bring about a balance. “Children of politicians, celebrities like film stars and persons with dubious credentials (as witnessed by the high number of our MPs & MLAs who have criminal cases against them) are the only ones who are assured an easy entry,” she says. Women candidates of state parties have the highest winning percentage. As per data, Samajwadi Party has 4 women MPs followed by All-India Trinamool Congress with 3 (almost 50% of total women candidates elected from state parties). INC, presently running the UPA Government, follows next with more than 50% winning percentage and an impressively low percent of women candidates (7%) whose security were forfeited. Interestingly, INC is followed by its coalition partner NCP and not the second biggest national party BJP. 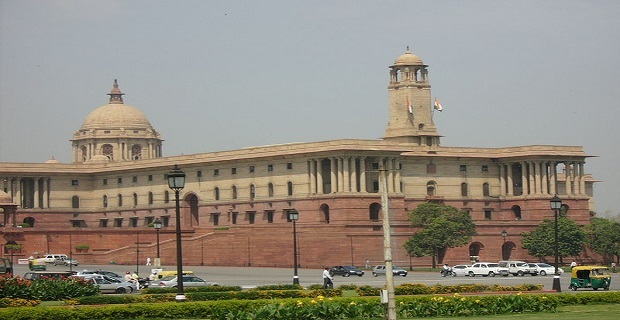 Shrimati Putul Kumari, elected from Banka, Bihar is the only Independent women parliamentarian in the Lok Sabha presently after winning in a 2010 by-election. The unrecognized but registered parties (96%) and Bahujan Samaj Party with 82% (national party) have the highest percent of women candidates whose security was forfeited. One probable reason for such high rate of forfeit could be the number of dummy candidates that every party floats. The analysis shows that women representation in Indian Parliament is dismally low if you compare it with the number of candidates every year. Moreover, India ranks 110th in the percentage of women MPs. Interestingly, 6 out of 10 countries with the highest percent of women MPs have women reservation. Therefore, to increase participation of women in Indian Parliament, reservation may be the path to represent the gender with 49% population in India. Women’s Reservation Bill of India, introduced in May 2008, proposed 33% reservation for women in the Lok Sabha and all the state legislative assemblies. While the Rajya Sabha passed the bill, the Lok Sabha, after much debate, has still not voted on the bill.